BKSM welcomes anyone to take courses with us for personal enrichment or continuing education! 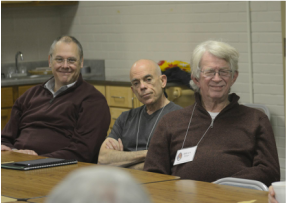 We encourage you to experience the remarkable community of learning, worship and fellowship that makes BKSM such a remarkable place for formation. Did you know that scholarships are available for students taking classes for personal enrichment? February courses begin officially on Monday, January 14 , the focus weekend takes place February 9-10, and final assignments are due on Friday, March 8. That being said, you are welcome to spend the night at Upton Hall on Friday night, and join us for breakfast and morning prayer on Saturday morning. While the 8:45 colloquium session is a closed group for students on ordination, PMA, and lay certificate tracks, you are encouraged to join us at 10:15 for our praxis session, which addresses some practical area of ministry. If you would like to audit a course, the tuition is $100. If you would like to take the class for credit, the tuition is $180. The cost includes meals and overnight accommodations at Upton Hall on Friday and Saturday night (on a space-available basis). If you wish to take the class for credit, we encourage you to enroll by December 10. If you wish to audit the class, you may register at any time prior to the focus weekend. However, your learning experience will be better if you have time to complete the assigned readings for the class. Get started by completing the online course registration form. If you have any questions, please contact the Very Rev. Dr. Don Compier, BKSM dean, at bksmdean2@gmail.com or (816) 217-4053. This course explores Christian history from the later Middle Ages to the late 20th century. Highlights include the wisdom of medieval theology, the Protestant and Catholic reformations, European Christianity encountering new continents and cultures, shock waves of the Enlightenment, and the great age of missionary activity. Mullin, Robert Bruce. A Short World History of Christianity. Revised Edition. Louisville: Westminister John Knox Press, 2014, pages 111-299. Noll, Mark A. Turning Points: Decisive Moments in the History of Christianity. Grand Rapids, MI: Baker Academic, 2012, pages 121-237, 261-305 (omit ch. 11). What Every Church Member Should Know about Poverty. Bill Ehlig & Ruby K. Payne, 1999. The Rev. Charles A. (Chas) Marks is Priest-in-Charge of St. Augustine's Church in Kansas City, MO and also serves as a Senior Advisor for Community & Church Relations for the Saint Francis Foundation. He is a graduate of Wichita State University, Saint Meinrad School of Theology, and The Bishop Kemper School for Ministry. Prior to his ordination to the priesthood in 2015, Chas worked in social services in Kansas City, MO and Memphis, TN. He spent 10 years managing programs that assist homeless and runaway youth in the Kansas City metropolitan area and also served on the Advisory Board of the National Safe Place Network. Chas has presented at several national conferences on issues around homeless youth and advocacy. Both he and co-instructor, Mthr. Anne Kyle, are certified facilitators of Called to Transformation: An Assest-Based Approach to Engaging Church & Community. Buechner, Frederick. Telling the Truth: The Gospel as Tragedy, Comedy, and Fairy Tale. Worship of the Christian assembly is at the heart of the church’s identity and purpose. It is in worship that we gather together as the people of God, in the presence of God, to hear the gospel, the good news of Christ, be fed with his body, so that we can be sent out to be that body, the body of Christ, in the world. This class will explore the purpose and importance of worship, as well as the central elements. We will also explore what makes worship “good” and meaningful, inviting people into a deeper relationship with God and one another so they are empowered to go out and serve the Lord and how we can plan and lead worship in a way that enhances the experience for all. The Rev. Susan Candea received her BA from California Lutheran College in 1979 and her Masters of Divinity in 1983 from Wartburg Theological Seminary in Dubuque, Iowa. She was ordained in the American Lutheran Church (which became the Evangelical Lutheran Church in America in 1988) in September of 1983, serving as the pastor of a two-point parish in western Kansas, and when she began serving a two-point parish in western Kansas. From there she served as the pastor of Our Savior’s Lutheran, Topeka, KS and King of Glory Lutheran, Loveland, CO. After 30 years of serving as a parish pastor, where she planned, lead, and presided at worship Sunday, she was called to serve as the Bishop’s Associate and Director for Evangelical Mission for the Central States Synod. Over the years, she has taught workshops and classes for lay leaders in a variety of areas, including worship.